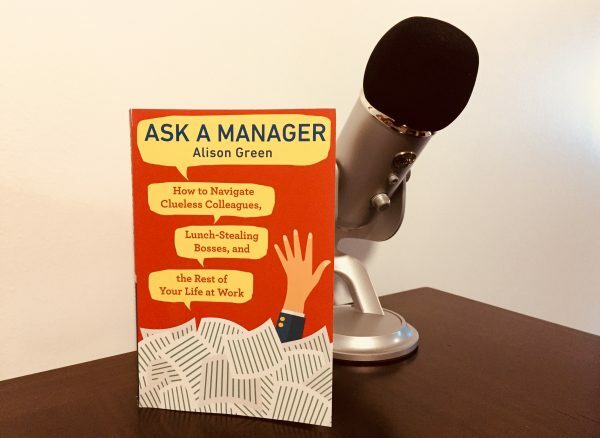 I know that a lot of you are already familiar with Alison Green and Ask a Manager, but I’m not sure if everyone knows that Alison’s new book, Ask a Manager: How to Navigate Clueless Colleagues, Lunch-Stealing Bosses, and the Rest of Your Life at Work, just released TODAY. I got an advance copy, and I also got to talk to Alison about how she structured the book, how people can initiate those awkward workplace conversations, and what advice she has for Billfold readers. “As a general theme,” Alison said, “people assume these conversations have to be more lengthy and complicated than they really do.” She suggests writing down a script or a series of bullet points before having an awkward conversation, and practicing what you’re going to say out loud. Some people have so much trouble with these types of conversations that they automatically skip over the most important part — which is why you might have a meeting with your manager where they never actually say the words “we’re unhappy with your performance,” even though that was supposed to be the whole point of the meeting. We have a tendency to avoid discussing anything that might be “painful or difficult,” as Alison put it, and practicing the words in front of the mirror will help you say them to a coworker or boss when the time comes. Who else is going to order the Ask a Manager book or get it from your local library?